This coffee undergoes a special drying process, where the skin of the coffee cherry is pulped on the farm, but the mucilage, parchment and silverskin remain intact. 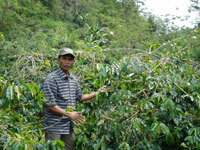 It is then dried and transfered to a central mill (Gayo Mountain) where it undergoes further drying. The mucilage and parchment layer are finally removed and then careful hand sorting to remove immature beans begins. In the cup this coffee is deep dry chocolate fragrance and winey fruit with sandlewood and clove throughout the finish.